"Here we go round the mulberry bush on a cold and frosty morning". Children's nursery rhyme...or biting political chant? When King James 1st imported mulberry trees to England in the 17th century in an attempt to imitate the Chinese silk industry, tradition tells of how he chose the wrong species for silk production, importing Black Mulberry, Morus nigra, which is great for fruit, not the more silkworm friendly White Mulberry, Morus alba. Not only did he pick the wrong species, but his trials were beset by problems including frost striking many young plants. In tense political times the children would chant rhymes about things their parents secretly thought, so we see that the rhyme is a scathing satire of the Tudor King's unsuccessful horticultural ideas of the time. Satirical rhymes in the 17th century would now appear as, say, a sarcastic meme on facebook - perhaps a dead tree and the caption "mulberries, anyone?"! 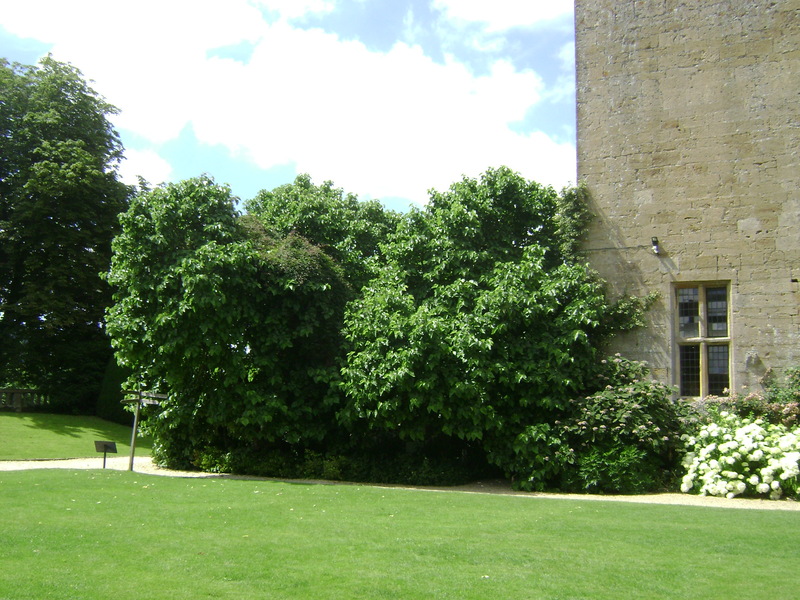 On a recent visit to Sudeley Castle in Gloucestershire, seat of the Tudor kings and queens, I spied a huge mulberry tree at one corner of the castle. (See picture) It had two large diameter trunks and was in full flower in July, spreading over a large shady area. While this may not be "the" mulberry bush - I bet it is a cutting from the original, because of the history and the tree's location. History, politics, royalty, castles, and exotic plants are always mixed up together in the ancient and bustling land of England, so I thought I would share with you a glimpse of what is possibly the original tree behind the story.